Are you looking for a Gift for your kids? Our Tactical Vest Kit will be a best choice for you! Every children has a hero dream,fulfill their hero dreams and let them become a hero,Your children will definitely love this gift! Tatical vest is very popular with the boys,which keeps them cool while running all around shooting people with his guns.It includes quite a lot of tactical vest accessories. Not to mention the basic,most essential hand wrist bands,quick reload clips, spare bullets, it has a pair of protective goggles, a scarf. You'll be ready for any battle situation more easily! Using safe and breathable Oxford fabric,very safety and durable. You'll be ready for any battle situation more easily! It's one of the best Nerf gun kits. Both the tactical vest and the hand wrist band are designed with adjustable velcro to fit most sizes for kids,teenagers and even grown-ups. Black Seamless skull face mask is breathable,and offering an awesome frightening visual impact outdoor activity and hide your true identity in the battle. Safety Eyewear protect your eyes against sun rays directly damage in the game and gives you the sharp look of a serious competitor.The beautiful color will make you look the coolest! 40 Pcs refill bullet soft darts, more darts for greater fun. Refill dart designed with high-quality foam body and new-type head,helps buffer impact force, non-toxic and safer shoot. Childrens Vest Kit: The tactical vest for kid is easy to put on and take off. It's one of the best Nerf gun kits. Like you are in the battlefield with ammo flying around you. 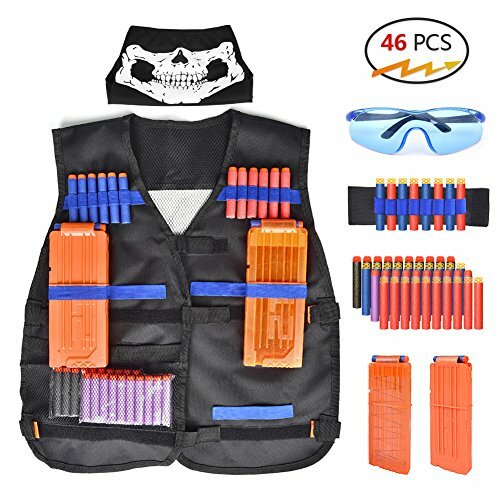 Kids Tactical Vest Kit: 1 x Tactical Vest(size 17*20.5inch),2 x Quick Reload Clips (12-darts),1x Hand wrist band,1 x Protective Glasses,1 x Tactical Mask,40 x Refill Foam Darts. Protective glasses protect you in the game, Black Seamless skull face mask that offering an awesome frightening visual impact outdoor activity and hide your true identity in the battle. Adjustable Straps and Wrist Bands: Both the tactical vest and the hand wrist band are designed with adjustable velcro to fit most sizes for kids,teenagers and even grown-ups. Great Birthday or Christmas gift for your kids and fulfill their hero dreams. Great Toys for Kids Blaster Play,Let them become a hero,Your children will definitely love this gift. If you have any questions about this product by Walsilk, contact us by completing and submitting the form below. If you are looking for a specif part number, please include it with your message.